Welcome to the October issue of the Learning Center Newsletter. This issue features the third installment of Frank's Christ Management Strategies and Tips. Also featured this month is "Support Groups for Students with Learning Disabilities" by Daniel Berkowitz from Boston University. Our Person of the Month Dr. Gene Kerstiens contributed an inspirational article on how fate helped him get into college. Other subjects include speed reading web sites, a great search engine, and an excellent FTP agent. Tip #4: Keep a Management Journal. In my first two years as the director of the Learning Assistance Center at CSU Long Beach, I kept a detailed journal of all my activities and campus interactions related to the Center, its programs and services. In this journal, I had a record for later review of every meeting or encounter with faculty, staff, and administration along with any commitments that I made, my comments on the meeting, and ideas for any action to be taken that might be considered for the good of the Center. I then reviewed this journal at the end of every week, every month, and at the end of each semester to be aware of what I was doing as the Center Director and what results my interactions had on my staff, center programs and services, its users and other university components. I believe that much of the success of the Learning assistance Support System program was attributable to this journal activity. Dr. Kerstiens has been involved with learning centers, learning support systems, and developmental programs for about 40 years. While working as a reading, writing, study skills, and literature instructor at El Camino College in 1968, Gene designed and developed what may be the earliest computer managed student assessment and placement program for a California Community college. At that time Gene realized that developmental courses were not sufficient to serve the growing number of students encountering difficulties in their classes. Consequently, as Associate Dean, Gene started a full facility learning assistance center, taking a semester off to become involved in a graduate program for developmental practitioners at Western Washington State University. President, WCRA (Western College Reading Association), now known as CRLA (College Reading and Learning Association). Editor, Review of Research in Developmental Education. Editorial Advisor, Journal of Reading and Journal of Developmental Education . Consultant, EDNET, Chancellor's Office, CA Community Colleges. When he was a student, Gene did not think he will be getting high degrees in education. As a matter of fact, he didn't think he'll be going to college at all. As he puts it "I have never entertained the notion of going to college. Nor had anyone in my family." So how did he end up graduating with high degrees and making a career as an educator? Make sure to read Gene's article below for his inspiring story. Congratulations Gene on your many accomplishments. We are glad to have you as our October's Person of the Month. By Dr. Gene Kerstiens, Ed. D.
Like so many students, both then and now, I had never entertained the notion of going to college. Nor had anyone in my family. Nor, as far as I know, had any of my schoolmates. At least they never talked about it. I had learned that if one were to show up, look alert, and not cause too much trouble, he could get passing grades while not allowing school to interfere too much with important lifetime experiences. Other than a course in general science and four semesters in typing classes, I was unable to identify any instructional occurrence of significance while being schooled. In 1943, I was attending my fourth high school, a small, parochial boys' school of 250 souls, where my mother thought my character might enjoy improvement. In Arizona, that a male high school senior would drink, smoke, chase girls, and play football was normal expectation. I majored in drinking and cutting classes, and proved to be a problem football player chiefly because the game was not suited to the ethical inclination of my personality. I'm a devout coward. But I made the second team and was playing regularly only because Louis Spritsma, first-string tackle and honor student, was injured. The day before the state championship game with Phoenix Union High School, the largest high school in the nation (10,000 students), Spritsma returned, hale and hardy. In a fit of understandable disgust and relief, the coach ordered me to turn in my suit. Should you think I digress and meander, be assured this sketch has a thematic thread. Now it's important to get the historical perspective. This game was a sports page hyped David-and-Goliath event that would be broadcast on radio statewide. In those days there was neither television nor were there transistor radios that stadium fans could listen to while observing the game. Consequently, even though I attended the game, I was oblivious to the radio account. And Spritsma's performance was epic. With broken nose and blood soaked uniform, he nevertheless performed spectacular sacks, countless tackles, any number of downfield blocks, and he recovered two fumbles. There was just one problem. On the radio announcer's program roster, the name of the left tackle had never been revised to reflect Spritsma's return. An article that I wrote on Stress and Students with Learning Disabilties discusses stress factors that affect students with learning disabilities as they make the transition into postsecondary education. That article includes a study by Geisthardt & Munsch (1996) on the coping strategies of students both with and without learning disabilities, and concluded that organizing and maintaining a professionally led student support group may prove beneficial to students dealing with stress and other issues. The following article outlines further research in this area, along with some concrete strategies for facilitating a student support group. Social support is known to directly enhance psychological well being and may buffer the effects of stress on students (Delworth and Hanson, 1989). Offering opportunities to meet in a small group atmosphere, with clear objectives, and positive leadership, may provide students both an outlet for their stress and the opportunity to share coping strategies with their peers. Furthermore, since students with disabilities also experience greater pressure to adjust to the educational environment, this may place them at greater risk of dropping out of school. Therefore, support groups for these students may be one factor toward helping them complete their educational programs and thereby increase retention rates. Kroeger and Schuck (1993) point out that such support may be "as crucial for the success of students with disabilities as ensuring academic accommodations" (pg. 64). In all likelihood, such a group will not spontaneously develop overnight, or at any point during the semester. It is you, the Service Provider, who will need to be the catalyst. The formation of a student support group can be a stressful experience unto itself. It can be frustrating to have the foresight that such a group would benefit students, and the understanding that they are probably reluctant to actively seek out other individuals and resources with which to form such a group. Google is a powerful engine which like Yahoo and Excite, began as a Stanford University research project. Google delivers fast, comprehensive, and relevant information. It's fast because it cashes the web pages it indexes. It's comprehensive because it indexes more than one billion web pages. The information is relevant thanks to complex search formulas that takes page popularity into consideration when determining relevance. Google is easy to use. All you need is type your search and click on a search button. The results page includes the page title, a description, the URL, a number representing the size of page text, a "Cashed" link, and a "Similar pages" link. The description is actually an excerpt of the text that matches your query, with your search terms in bold. The "Cashed" link is the snapshot of the page as it looked when Google visited it. The "Similar pages" link runs another search for pages related to this result. Google searches are not case sensitive. All letters, regardless of how you type them, will be understood as lower case. Google does not use "stemming" or support "wildcard" searches. This means a search for "cat" yields different results from a search for "cats", and a search for "dance" yields different results from "dancing". Google only returns those pages that include all of your search terms. There is no need to include "and" between terms. You can also click on a "I'm feeling lucky" button, which takes you directly to the first Web page retrieved by your query. This is useful for quick info lookups. Use Google's Advance Search for more options, including Google's University Search, which enables you to narrow your search to a specific school website. Use the "Language, Display, & Filtering Options" to set and save language options, default number of results, and to block web pages containing explicit sexual content from appearing in search results. If the site is down or no the page no longer exists, you can still view the page in Google's cash. Your search terms are highlighted on the cached version, which makes easier to find what you seek. The cashed version is faster than the direct link since it comes from Google's site. Oh and if you're wondering the name came from the word "googol", a huge number: 10 to the power of 100. This month we feature links to speed reading resources on the web. This includes courses, tips, and software for speed reading. and words per minute speed is maintained. AceReader: Speed reading shareware. 30-day limited demo. $25 registration fee. Windows and Mac versions. FReader: or Efficient Reader is another computer program designed to improve reading skills. You can download a free limited demo. So why use an FTP client? A common reason is to maintain web sites. Another is to download large files from the Internet. FTP file transfers are usually quicker and more reliable than http (web browser) transfers. FTP offers other advantages such as the ability to resume interrupted downloads. 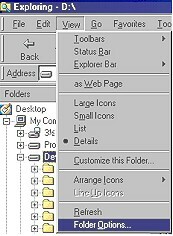 The User Interface is patterned after the Windows Explorer. You transfer files by simply highlighting them one pane and dragging and dropping them into the other. Ability to transfer files directly between FTP servers, taking advantage of the great bandwidth for quickly moving large files across servers. Ability to resume interrupted downloads. Synchronization function that allows you to mirror files and folders. Ability to queue file transfers. Automatic switching from binary to text mode depending on file type. One of the cool things about Windows is that it can automatically launch an application when you run one of its files. For example, you can double click a document file in Windows Explorer or on your desktop, and Windows will launch your Word Processor application and load the file automatically. So how does Windows know which application to launch for each file type? Applications register their associated file types when you install them. For example, when you install MS Word, the installation program registers document files (*.doc) so when you run such a file Windows launches Word automatically. What if you install more than one application for a certain file type? Usually, the application installed last wins. For example, if you install MS Word and then install WordPerfect, the doc association will change from Word to WordPerfect. Luckily, Windows provide you with a utility for changing the association. Start by launching Windows Explorer and select "View" - "Folder Options". From the screenshot above you can see that text files (*.txt") are associated with Window's "Notepad". This is the Windows default. 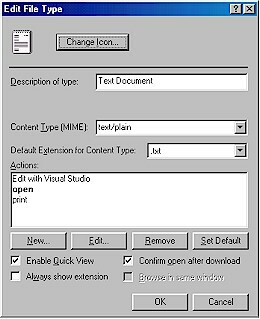 Suppose you want to change this so text files are opened with MS Word instead. 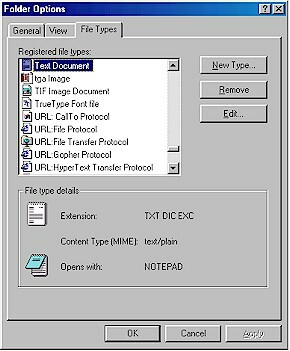 First highlight the "Text Document" item in the Registered file types list box, then click on the "Edit" button. You will see the "Edit File Type" box. The first button allows you to change the icon associated with the file type. The icon appears next to the file name in Windows Explorer and on your Desktop. The "Actions" box shows commands associated with this file type. The commands appear on the shortcut menu for the file type. You will see the shortcut menu if you click on the file with the RIGHT mouse button in Windows Explorer. To change the associated application with a file when you open (e.g. double click) on it, highlight the "open" item and click on the "Edit" button. This will bring the edit action box. Click on OK to save your changes. Now each time you open a text file it will open in Word. You can do the same to change the associations of other file type such as web document, image files, etc. Next month we will show you a quicker way of changing the association between a file type and an application. An AST customer was asked to send a copy of her defective diskettes. A few days later a letter arrived from the customer along with Xeroxed copies of the floppies. Another Dell customer needed help setting up a new program, so a Dell tech suggested he go to the local Egghead. "Yeah, I got me a couple of friends, "the customer replied. When told Egghead was a software store, the man said, "Oh, I thought you meant for me to find a couple of geeks." Tech: "Please excuse me if I seem a bit stumped, It's because I am. Did you receive this as part of a promotional, at a trade show? How did you get this cup holder? At this point the Tech Rep realized the caller had been using the load drawer of the CD-ROM drive as a cup holder, and snapped it off the drive! "It takes less time to do things right that to explain why you did it wrong." "If I believe I cannot do something, it makes me incapable of doing it. But when I believe I can, then I acquire the ability to do it, even if I did not have the ability in the beginning." This newsletter is produced by Mon Nasser from Engineerica Systems, Inc. My thanks to this month's contributors: Frank Christ, Daniel J. Berkowitz, and Dr. Gene Kerstiens. "Think Resources Rather Than Money", a tip from Frank Christ. Dr. Martha Maxwell, September's Person of the Month. "Stress and Students with Learning Disabilities" by Daniel Berkowitz. How to browse the web and contribute to charity. The National Resource Center for Students in Transition. Free computer security check and firewall software. Quotes by Soichiro Honda, Mark Twain, Ghandi, Disney and others.